Kagyu Samye Ling 1997 Translator: Pema Lama. Slightly edited. When Lama Yeshe Losal was in Kathmandu he asked him to come over to Samye Ling and that’s why Lama Phuntsok has come here and he would like to wish you all many tashi delegs. And when he got here other day Akong Rinpoche said that there are few chortens [stupas] in the West but he is very keen to have a very proportionally and properly build chorten in Samye Ling. He asked him to help with that. This chorten is going to be about 42 ft [12,8 metres]. And also Akong Rinpoche asked Lama Phuntsok to give a talk about the reasons for building a chorten and the relics that are put in a chorten. In Buddhism the Three Jewels are the ones which in one takes refuge. There are the outer Three Jewels, the inner Three Jewels and the Ultimate Three Jewels. So there are like three kinds of the Three Jewels as well. In the outer Three Jewels there are the image of the Buddha, image of the Dharma and image of the Sangha. And in that there are also the three aspects of the body, mind and speech. The representation of the body part there are usually the images of Buddhas, rupas, for the Dharma it’s usually the Dharma texts, puja texts, and for the mind it’s the stupa. Therefore in Buddhism it’s not enough just to have a building of a temple, but it needs the inner things in the temple. So that’s why when you have an outward temple, one also needs the… for the inside one the images of Buddha, and the pujas, the texts, and for the mind aspect a stupa is needed. This time we are talking about the mind aspect, which is the stupa. In Tibetan tuk is the polite form and other words for mind is also sem and yid. Also we have this other vocabulary, which is like ly, nga, yid, which means “body, speech and mind”. Of the three the mind, yid, is most important. The importance of the mind aspect is also being taught in the sutras and other teachings of the Buddha. The stupa is the representation of the mind aspect and in the stupas there are also two kinds, there are vajrayana kind and sutra kind. There is also a variety of forms which can be seen, for example the three chortens in Kathmandu, and there is the chorten in India, Bodhgaya, there are some big ones in Indonesia. They all look slightly different. The difference is in the outward look of these chortens because of how the chortens have been built in different countries through different traditions. That is the reason for that. And the same can be found in the image of Buddha as well, you see that the image of Buddha looks different in different countries, the Indonesian and Indian Buddhas they look slightly different. That’s again because of different culture and tradition. So there are these slight differences, but the main thing is that Nagarjuna has taught about chortens and he has talked about eight different aspects of chorten as well. These eight different chortens commemorate Buddhas different life stages, so that’s why there are eight different things; they are commemorating his eight different stages in life. 1. Out of the eight the first one is called The Stupa of Heap of Lotuses. This first one is to represent the Buddha’s birth. When he was born he took seven steps and seven lotus flowers appeared when he took the steps. So this stupa commemorates that birth. And usually you see the stupa sits on a lotus flower. 2. The second stupa is called The Enlightenment Stupa. This stupa commemorates Buddha achieving enlightenment in Bodhgaya. 3. The third stupa commemorates Buddha’s teachings in Varanasi, the turning of the Wheel of Dharma and The Four Noble Truths. The name of that stupa is The Stupa of Turning of the Wheel of Dharma. 4. The fourh chorten is called The Stupa of Conquest and this one is in India in a place called Neyö where Buddha conquered lot of non-believers and he performed miracles and that is to commemorate that. 5. Then there is the chorten which commemorates Buddha going up to the realm of Tushita, the 33rd Buddha Land. This is not real Pure Land but it’s a realm of gods, and Buddha’s mother was reborn there. So, to repay her kindness Buddha went there, did a retreat there to help his mother, and this stupa commemorates Buddha returning to this world. It’s called The Stupa of Descent from Gods’ Realm. 6. During the time of Buddha there was a Mara called Lejön, and he was causing problems in the Sangha and causing fights and arguments. And then Buddha stopped that and made them to reconcile and there is a stupa for that and it’s called The Stupa of Reconciliation, so where this Mara was stopped causing a fight in the Sangha. 7. The seventh stupa is called The Stupa of Victory. And this one is when Buddha was about to pass away. And then his death was postponed. And this stupa is called The Stupa of Prolonging Buddha’s Life. 8. The eight stupa is called The Stupa of Nirvana. This one is commemorating Buddha’s passing away to Nirvana. So these eight aspects of the stupas are taught, mainly by Nagarjuna. These eight stupas are famous among all Buddhists and particularly in the Tibetan Buddhism these eight stupas are very popular. The difference among the eight stupas is – you will see that not at the base but after the base then the difference is seen. So when we start to build the stupas in Samye Ling, if you take a close look you will see the differences among the eight stupas. Because the differences start after the base. There are also some differences in the way of building stupas between Tibetans, Nepalese and Indians. Usually the Nepalese and Indian stupas have no base and they start right from the ground. The Tibetan way of doing stupas they always have a base or a seat, we call it a lion seat, and the stupa goes on top of the seat. Having the lion seat starts from the time of Buddha as well. Having eight lions in a seat was considered very auspicious and good, and from there on you see the seat for Buddhas and for stupas and sometimes when it’s done in a simple form, you don’t have the lion but you still have a seat. The reason for having a seat is that the Buddha is slightly higher. That’s why in Tibetan tradition the stupas have this lion seat; this is more for the height. The stupa itself has quite a few different levels and the levels have their own specific names. The stupa has 37 levels and that represents the 37 different stages in the Mahayana tradition of the Dharma and how the mind progresses from these different stages from the basic to the enlightenment. So it represents these 37 stages. This one also includes the Five Paths. From these Five Paths through these Ten Levels of the Bodhisattvas – makes sense? One is not enlightened yet. The enlightenment is only reached after the tenth level, when one reaches the tingezin of the dorje, the vajra-samadhi. One divides these Five Paths further, so one gets these 37 stages. That’s why the chorten has the 37 levels as well, so it’s not that someone decided: “I will have one level up here.” This is all quite representative of the progress of the mind. So the reason for this is not because… you know, some artist doesn’t decide that this is going to be a chorten and some maybe make a beautiful one and others might not be as beautiful. It might end up in all different ways, whereas once this is all clearly decided. The reasons and how it should be done they are all clearly made out and that’s how the chortens are normally built. The plans for chortens have been written out by Nagarjuna and the great realized lamas after that. They have done that by looking at the sutras and the tantra teachings. It’s not that they decided that they write how it should be, but they wrote it out looking at the teachings in the sutra and the tantra. Even though it’s all quite fully laid out you still see differences in the four schools of Tibetan Buddhism, because they all interpret it slightly different. The difference among the four schools is very slight, but the reason for that mainly is because some lamas thought: “if I put the relics this way it’s easier or maybe it’s going to look slightly more prettier…” or, you know, they have made slight differences in that way for these reasons. The chortens in Samye Ling are going to be built on the basis of the Karma Kagyu lineage, that’s has been decided. The plans for the chortens in Samye Ling are originally written out by the eight Karmapa Mikyo Dorje. He wrote a full text on the chorten, but after that Jamgon Kongtrul also wrote slightly more sort of commentary for that text. 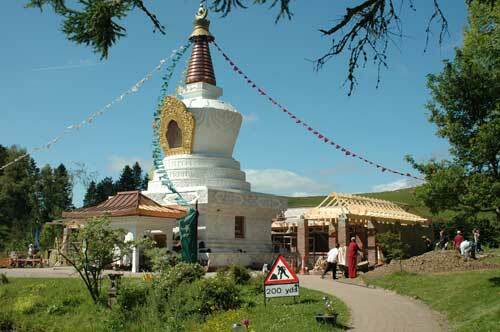 So the chortens in Samye Ling are going to be based on the Jamgon Kongtrul’s plans. And Lama Yeshe and Akong Rinpoche both have placed a lot of importance in building these chortens, obviously they are very aware of the reasons for building it. And Lama-la says: “As I’ve said before, stupas are the representation of the Buddha’s mind and that’s why it’s very important to build that.” And other reason also is that normally many temples have been built and they get destroyed over the time, whereas many chortens have survived lot of destruction, for example the stupa in Bodghgaya, the stupas in Nepal and the stupas in Indonesia, they have survived a very long time, and he feels that the stupas seem to survive longer than temples. And so in building a chorten, if one has the resources, then the best material is used: gold, all the good metals. If one doesn’t have the resources, then one can use just mud and wood, and if one still doesn’t have that much resources then one just builds a very small chorten which is called a tsa tsa, and it is just out of clay. And even that tsa tsa represents the eight aspects of a chorten. So, if one builds a chorten with the right motivation, then it doesn’t matter about the size and the material used, because the benefit is the same. And Akong Rinpoche, Lama Yeshe and all of yourselves, all of the Samye Ling community has expressed the wish to build a very big chorten, and he feels that it’s a very great kalpa, it is auspicious and great karma that you are able to do that. So this is very great karma, because Buddhadharma has not really been established in the West for long, maybe it’s about thirty years. In that there are not many important relics in the West. So if we can build this chorten, then it doesn’t only benefit Samye Ling, not just the local area, but the whole country, the whole world, the whole universe, and so the benefit is immeasurable. So, due to that reason, that’s why many people like yourselves are coming together, putting in whatever one can, either financially or by hard work, in every way that one can you are coming together and wanting to build this chorten. Therefore Lama feels that it’s a very great karma and kalpa (there is that word in Tibetan), that you all can come together and do that. Obviously in chorten the most important part is not just the outward look but the inner relic is the most important part in the chorten. The outward look of the chorten has to be in the standard way, which has the 37 levels and Five Paths, and for the relics again it has to follow the text. For the relic part there are variations in the text. The one that we are going to follow in Samye Ling, it’s called The Two Stainless Varieties/Types. This one has two different deities and two different mandalas, so this involves a lot of pujas and building mandalas and a lot of work. So it’s very important to have the outward form of the chorten right and it’s also important to have the inner relic right and to do everything right in that way. Once that is done then this chorten will benefit beings for aions. So Lama-la will talk about relics and the work tomorrow. Once the relics are gathered then again it’s very important to have a realized Lama to bless the chorten. If that comes together then the outer, inner and secret aspects are fulfilled. So the outer form must be right, the inner relic must be right and the blessing must be done by the right being. For making the relics Akong Rinpoche said that he will make groups, and that’s quite useful way. So if we can make as much relics as possible then Situ Rinpoche is going to visit Samye Ling in August and he can bless it. And the Lama feels that there can’t be any greater karma than all this coming together so well. So he would urge that we do the relics as quickly and as hard-workingly as possible. Also there are prayers, pujas to be done for these relics and that Lama-la will discuss again with Rinpoche and Lama Yeshe and we have to do that as well. But the relics must be finished before the prayers are done. Because during the pujas one needs all the relics finished and then one has the relics in front and then the pujas are done. Akong Rinpoche has also talk you about it, and Lama-la would just urge this again that maybe day after tomorrow we will start the relics and that everybody knows their work and does one’s best. And tomorrow he will talk about how to do the relics. So Lama-la would like to stop here, he is not able to talk too wide on this. Lama: It’s not decided which aspect among the eight the big one is going to be, Lama-la will discuss this with Lama Yeshe and Rinpoche. Question: How long this chorten will last? Lama: They can’t give a definite date, but it depends al lot on how well it is looked after! Some chortens like the chorten in Bodhgaya have lasted since the time of the Buddha, sometimes others can be destroyed quite quickly as well. Lama: That’s possible, sometimes the auspiciousness is very important in chortens, and if that aspect is not together, there are examples of chortens being built and cracks appearing out of no reason. That’s why in Tibetan Buddhism usually lots of pujas are done before a chorten is built, just so that the obstacles are removed. So, when we start the chorten, could you all please, when you do your pujas, do pujas for the chorten and think about the chorten when you are doing the pujas, so that obstacles are removed. Lama: Stupa is an object for making prayers. So usually when one is making prayers one needs to make the prayer to someone, and stupa is that object. It’s quite important then that object is right. Just thinking is not enough. For example, if one has food in front of you, it’s not enough to think “I will eat the food”, but then the food is not going to go in one’s stomach. One has to eat it. Like that one has to do it instead of just thinking. In the Buddhadharma normally the trust is quite important, because if one doesn’t have the trust then the devotion and all the other things that are needed don’t really come. Lama-la was in America few years ago and he saw Lama Yeshe’s retreat house. And he heard a lot about Lama Yeshe but he had never seen him. At that time Lama Yeshe had already gone to the UK, so he was not in the States. This year there was all Kagyus’ meeting, the second Kagyu meeting in India and Lama Yeshe was there for the meeting. And Lama Phuntsok-la had gone for that meeting as well and he saw him there and they were together for fifteen days. So at that time Lama Yeshe said he would really like to build a chorten in Samye Ling, but he said he was very unsure about starting it, because he wanted it to be right and he didn’t really know how Samye Ling was going to manage it. So he asked Lama-la that he had heard that Lama Phuntsok has good experience in this field and so he has asked Lama Phuntsok-la could he please come and help with that. Also Lama Yeshe had said to him, if he could come in July and August then the weather is also nice! So that’s why Lama-la came in this time. As Lama Yeshe said, it’s lovely here. Lama Yeshe came to Kathmandu, to Lama Phuntsok’s monastery twice, he has seen his monastery and the chorten there and he was very pleased. [Translator: I went with Lama Yeshe, by the way.] Lama Phuntsok has built a chorten in his monastery and this was because Karmapa from Tsurphu had asked him to build a chorten. And he says his chorten is not as big. In Nepal there are many chortens. Chorten by the way is stupa, all a long I have been just using it. So, Lama Yeshe said he would like to build a chorten. Lama: Yes. This chorten in Samye Ling is going to have a room in the seat part of the chorten. After the seat then all the relics have to go, so there is no room there, but the seat of the chorten will form a room inside, and people can meditate and do pujas. Lama Phuntsok thinks there are many centres in the West, but Samye Ling is quite special because you have lot of sangha here. Lama has been to few countries in the East like Malaysia and Singapore and these countries, and also he has been in the States and in Germany, and few countries in Europe, but he hasn’t really seen many sanghas in these centres, so it’s really nice to see many sanghas here. And because, Lama says, he has this habitual tendency of having lived with lot of sanghas all his life, he is always pleased to see people in robes. It seems there are no more questions. For attaining enlightenment just sitting around is not enough. One has to accumulate merit and do purifications. In the Five Paths everything has to do with accumulating merit and purifications. There are loads of different ways of accumulating merit, for example doing prostrations, saying pujas and meditating, all of these are accumulating merits, but in the dharma the supreme accumulation of merit is considered to be following one’s Guru. And particularly in the Kagyu Lineage there is this example of following the Guru like Milarepa followed Marpa, and the importance of following one’s Guru is very, very clearly shown in that. Very often if the Lama says something, maybe the student feels: “Oh, it’s not really…” student is not very happy with it, but normally it’s for the benefit of the student even though the student doesn’t like it at that moment. In the texts for making the relics usually it says: ideally one should be a gelong to do it, after that it’s getsul and then after that the lay people, but who have the precepts. So lay people can make relics, but they need to take precepts, and then it’s a very good way of accumulating merit for the lay people. Some people may feel: “Oh, why is it just the sangha with – you know, gelongs and getsuls can do it, why not lay people?” And they might feel little bit upset with that. There is really a difference between lay people and the sangha. In Dharma normally the important thing is the mind. If one has a clear mind with motivation and with devotion, then that’s the important part. In Tibet there people usually accept that male and female are different and there isn’t a lot of problem with that, but normally in the West people always want to think that male and female are the same and everybody is the same. Lama-la feels that maybe there is a slight difference between the gelongs and the lay people. They are different because the way of life of a lay person and the way of life of a gelong or sangha are really quite different. The sanghas have to really stay and live their life according to the way it has been described by the Buddha. It’s the same with the country as well. The country has laws, and then people who follow the law are considered good and people who break the law are not considered good. The difference is something like that; the sanghas are following the Buddha’s law. Now we can say the sanghas are following the Buddha’s law. Actually only the sanghas themselves know whether they are following the Buddha’s law. Also in the sangha itself there are three kinds of sangha. In the so thar -one [The Moral Conduct of Individual Liberation] there are the 253 [vows], in the Mahayana there are 18 roots and many, many branches, and in the Vajrayana the discipline gets even more, there are the body, speech and mind aspects and it’s a lot more. So the sangha has lot of discipline to follow and they try to follow as best as they can. So the sangha has many laws to follow, even just this robe, you can see they wear this red robe all the time, and that’s one of the disciplines. And they have chosen to wear this particular robe for the rest of their life, so that is just following one of the Buddha’s rules. So that’s why Lama-la sees there are some differences between the sanghas and lay people. Translator: What you are saying is that maybe sanghas look different, but maybe on the level of mind development whether they are superior or not…? Oh, are you also saying maybe sanghas take the robes for the sake of identification, so that…? I don’t think I quite understand this but I will try my best. Lama: For real bodhicitta one needs what is in Tibetan word ningjum. Ningjum is like you have to get disgusted with the samsara. Unless one is disgusted with the samsara, then this real bodhicitta really doesn’t arise in the mind. So one will have a concept of bodhicitta and understand it and everything, but it doesn’t arise in the mind, unless this ningjum, which is this, you know, shen log, one is fed up with the samsara, then the bodhicitta comes. So really the way of the life of the sangha is representing this disgustion with the samsara, so it’s sort of going towards that way. People maybe have moments of bodhicitta, maybe a hunter is having moments of bodhicitta, but really the life of a hunter makes it very difficult to be disgusted with the samsara because it’s very, very samsaric activity of killing and doing way he is doing. So it’s difficult to say that person has the real bodhicitta, because the way that person is doing things, it’s not in accordance with the ningjum, the turning away from samsara. Everybody feels sympathy and pity and all these things. “Oh, somebody is in a difficult state”, one feels all these emotions, but it’s really not real compassion, it’s more attachment. Bodhicitta is when even if the object of your sympathy or pity is your enemy, then one is able to say: “He is my enemy, but I really want to help him.” That attitude is bodhicitta. There are many different types of bodhicitta, but really the basic thing is to help others. That is bodhicitta. Bodhicitta is the wish to help others. Lama: Lama completely agrees with you, there are many, many lay people who are genuinely practicing dharma and practicing hard. So, for example in this group we have maybe half sangha and half non-sangha, but Lama is not saying that the ones who are non-sangha are not practicing Dharma. Really the only difference is that the people who are in robes they are in robes and then all their time is either puja or work for the temple or the Dharma, that’s their work. Whereas for the lay person it’s wonderful they are able to be here today but when they leave here maybe they have a job, so they have an entirely different set of things to do, apart from being practicing Dharma for couple of hours. Whereas for the sangha it’s meant to be that their whole life is for practicing Dharma. Therefore there is this difference. And the lay people they have to watch their time and they are working in their jobs. Maybe the jobs are wonderful and that is the same as Dharma but then one cannot say that all jobs are. Lama: The five precepts are not to kill, not to take what is not given to oneself, not to lie, sexual misconduct and not to drink alcohol. Also in the Dharma there are there are these five precepts and there are lots of explanations about it, for example about killing. The most negativity with killing is that one kills something knowingly that wants to kill it and one wants it to die when one kills it. That’s premeditated, whereas if one kills it by accident, for example one is walking on the road and a small insect gets killed, then that killing is meant to be smaller negativity than the premeditated killing. So there is lot of further explanation on these precepts. Also in the sexual misconduct for lay people it usually means adultery, not to commit adultery. For the sangha it’s celibacy. So, there are these differences in the precepts, yes. Lama: The precepts can be taken just for 24 hours. Then what one does is one comes and takes the precepts in the morning and says: “Till tomorrow.” If one carries on doing that then one can do the relics, so it have to be lifetime. Lama: In the Vajrayana there are four traditions and in one of them one is not allowed to eat meat and fish and non-vegetarian [food – kriya yoga], whereas there are these other ones where one has to eat meat. For this one, the relics we are doing: The Two Stainless Parts (Varieties/Types), for that one has to stop eating meat. So, yes, then you have the five precepts plus no meat and no alcohol. Lama: In the teachings it says that if one kills by accident, not for one’s own private reason, then the negativity is minimized or almost not there. So when we are working on the chorten then we are not doing something to ourselves, so the negativity is not there or very little. If that was there it would be quite hard to find people to help for building because nobody would want to do anything. So, yes, the teaching says there is no negativity in that. Yesterday I talked briefly about the history and the different aspects of chortens. And today we will look into the relic part of the chorten. The relic is really the most important part of the chorten, because if the relic is not right, then the benefit of the chorten is reduced. It’s similar to a human being: it’s not enough to have a body but the body needs a life force in it for it to be a complete human being. In the same way chorten needs a proper relic for it to be complete. So what we need for the relic? In brief there are five different kinds of relics that are needed. The first one is the Dharma relic. Then the second one is the body (corpse) of the Buddha. The third one is a relic from the robe. The fourth is a tiny granular sort of relic. It’s very small, like a white grain, and that also comes from the Lamas. The fifth one is the mantra relic. So these five different kinds are necessary. For the first one the Dharma relic [tsuktor namgyal] what is needed is the tsa tsas. Each tsa tsa has eight impressions of chortens on it. The tsa tsas also come in different sizes, but they normally have eight chortens. The eight chortens can be clearly seen in the bigger tsa tsas, in the smaller ones they are there but they are not as clear. So that’s the first one, Dharma relic. The tsa tsa is representing the first relic. The tsa tsa is representing the Dharmakaya aspect and also it’s the Mind aspect for the chorten. So that is the first relic, and it is the Dharmakaya relic. The second relic is the relic from the dead body of the Buddha [tsuktor drime] and for that you can have the bone of Buddha Shakyamuni himself or after that all the great siddhas like Marpa and Milarepa, and it can come down right up to the 16th Karmapa, any remains can be used for the second relic. So that is the second relic, it is called “the remains of Buddha”. Also one can use the remains of one’s own Root Guru as well. The third one is the robe of one’s Guru or the Buddha [sangwa ringsel]. In that one can use the remains of robes or hair or nail. The fourth one is the relic which looks like a white grain, and that usually can come from the Buddha Shakyamuni himself and also all the realized beings who follow the Buddha [chanchub chyenbum]. And if one has one [grain], sometimes they can increase and multiply, so one can become many hundreds. It’s like very small white pill-like thing. And that is the fourth relic that is used in the chorten. So out of the five different relics the supreme one is the white pill or granule relic. The fifth relic is the Dharma relic [tendrel nyingpo]. In that are all the Dharma texts and sutras, all the mantras are included in that. This one includes the 84,000 teachings of Buddha and in brief it can just be looked as the Vajrayana and the other different Vehicles. Of the teachings of the Buddha in Tibet there is the translation of the sutra, which has 103 volumes. That is the Kangyur, which is the teachings of Buddha itself or the words of Buddha. And then there is another set of volumes which are again a translation of works of the realized beings, who followed the Buddha. That is called Tengyur and there are 203 volumes in that. So both those sets are considered as a Dharma relic. Not only that, there are also five special mantras that are specially written for using in the stupa. They are called the five great mantras for using in the stupas. These five great mantras can be used in stupas as well as in rupas or statues of buddhas. There are five great mantras. The first one is tsuktor namgyal, victorious crown. (Tsuktor is crown chakra.) Second one is stainless crown, the pure crown, which has no stains on it. The third one is the secret relic, the fourth one is enlightenment and the fifth one is the essence of interdependence. These are the five great mantras. These five great mantras they can be used in any part of… if it was a statue it can be placed in the head, in the middle part or base, it doesn’t matter on which level these are placed. But there are also other certain mantras which have to go in their own specific places. But these five great mantras, they can go anywhere and they are quite important. If it was a statue then the mantras used also depend on what statue it is, for example if it’s Shakyamuni, then the Shakyamuni mantra will be used and if it was Guru Rinpoche, then Guru Rinpoche mantra, and if it is Karmapa, then one will use Karmapa chenno mantras, which would form the majority of mantra in the rupa. For stupas, yesterday we talked about the particular relic that is being used in Samye Ling, the Two Stainless Varieties, it’s called drime lamnyi, that would be the main mantra used for the stupa. So whatever the size of the stupa, it has to be filled with that mantra. Basically the chorten has to be filled with all five different kinds of relics. For example in Tibet, if it was a very large rupa or stupa, then many sets of volumes of either kind, Kangyur the works of Buddha, or Tengyur, many sets are put in the stupa. If it’s a very large size it will take many sets. So that is put in as representing for the Dharma relic. Then also lots of prayers and auspiciousness for Lama, Yidam and Protectors and all these things are placed in the stupa as well. Out of the five relics the most difficult relic to find is the granule relic, the small grain looking thing. Lama-la has found that in China they normally just use one relic and usually it’s either the relic of the Buddha or the relic of one’s Root Lama, but in Tibet they use five different kinds of relics and it’s many more. The reason for using so many more relics in Tibet is really to accumulate merit and purify negativity. So that’s the brief explanation about relics, and now for building the chorten we are talking more about tsa tsas and the prayer texts. So, most of the work involves the tsa tsas and getting the prayer texts together. And other thing that is absolutely essential for chorten is the tsoshin, it’s like… tso is life force and shin is wood. For the life force tree the best tree to use is white sandalwood tree or red sandalwood tree. If not, then one can use pine tree and if one still can’t get that then any tree that doesn’t produce poisonous fruit is suitable. For the life force tree, for the tsoshin one first needs choose a particular tree and then before cutting it then prayers have to be done and tormas made, before one cuts this tree. The reason for offering tormas is because the tree maybe is being used by non-human beings, different other beings, which we don’t see, so we are sort of making the offering of tormas and saying to these beings that you know, could we take this tree, and then make the offering for it, so that they don’t get annoyed with their tree being cut down and losing their tree. So that they don’t cause any obstacles, as well. And also the other thing one needs to do before cutting the tree is to find the direction of East and then one marks this direction, and when the tree is cut down it has to be carried to that direction. And then the tree has a tapering shape. It has a wider base and is narrow at the tip. And for the tsoshin what one does at the tip, either one can carve Victorious Chorten, or if one can’t do that, then one draws a picture of Victorious Chorten at the tip. And at the base one again, either carves or draws picture of half dorje. Also one needs to make small holes at the top and at the base of the tsoshin and in this hole relics are put in and also blessed medicines. They are not medicines in terms of particular disease but they are sort of blessed pills, ground and they help with everything. These blessed pills are put in and then sealed. After doing that, if the tsoshin is red sandalwood, then it doesn’t need to be painted, but other than that it needs to be painted with red colour. And then one writes many mantras on the tsoshin. So, resources permitting, then the mantras are written in gold or silver, or not, very clean ink is used to write the mantras. If it’s a large tsoshin, all the mantras can be written out elaborately, but if it’s a small tsoshin, then the mantras are written in abbreviated [way] and not everything can be written on it. After having written the mantras, robe is offered to the tsoshin, so one uses at least very clean material, but obviously whatever the very best material that one can afford is used and wrapped around the tsoshin. And again the whole idea to accumulate merit, so one uses the best one has for all these materials. The tsoshin is the main part of the chorten, so one has the tsoshin in the middle and then all the other relics are sort of filled in along the tsoshin. So that forms the main relic of the chorten, the tsoshin and all the other relics. The people, who are involved in doing the songjuk, are normally ideally people, who have the gelong precepts, then it can go down from gelong to getsul, or if it’s lay people, at least it must be people who have taken refuge and who will maintain the eight precepts for over the 24 hours. Once all the relic materials are gathered then prayers have to be done. For the prayers again one needs as realized Lamas, as many as possible, and also sangha who have gelong vows or sangha who have getsul or other vows. 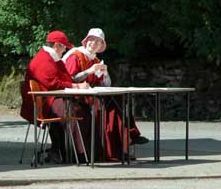 And also people who have done the four preliminaries or anybody who has done some practice. Even if there are people who are not sangha, there are many people who have done the four preliminaries or people who have completed the long retreat and these kinds of people are very useful. The person who leads the prayers for the relics needs to be someone who has taken empowerments and maintained the commitments of the empowerments and also who knows how to conduct the prayers and knows how to use all the Dharma objects. On top of that particularly important is the person with the right motivation. The motivation must be something that is not depending on the size of the chorten. So it mustn’t be: “This is a small chorten” – then it is a small motivation. It doesn’t matter what the size of the chorten is but the main motivation is that this is being done for the benefit of all sentient beings. The different Vehicles do not depend on who is more strong or less strong but it depends on the width of the capacity of the motivation, so if one has big motivation, then it’s the big Vehicle and if one has smaller motivation, then it’s the small [Vehicle]. So everybody who is involved in the chorten, whether people who are directly involved in working or people who are helping to finance it, the motivation of those people is not to think this chorten is being built for myself or for us only, but to think that this chorten is being built for the benefit of all sentient beings. So one needs to have this right motivation, and other important thing that is needed is to have the right view and in Tibetan Buddhism there are four schools. In the four schools there are two in the Hinayana and two in the Mahayana. There are some differences in the views of these four different schools and the difference is in the motivation. So there are two in the Hinayana: the nyendö and dodepa. These two schools do understand and accept that self is not true; they accept or believe that I or the self is not true. In the Mahayana there are two schools: semsampa [Mind Only] and umapa [Middle Way, Madhyamaka]. There is slight difference between the two Mahayana ones as well. The semsampa group believes that self is not true and other is not true as well, but they say that there is rigpa, a third aspect which is true. But Madhyamaka School they believe that self is not true, phenomena is not true either and then this rigpa is not true. Umapa doesn’t accept any of the tree. That is the view, when we talk about views. There are these different kinds of views. When we talk about views, that’s what is meant. There are also different names for the views. For example in Kagyu it is the Mahamudra, in Nyingma it is the Dzogchen, and Sakya and Geluk have their own. Each of these views has their own set of paths. For example Mahamudra has three kinds: there are Sutra Mahamudra, Vajrayana Mahamudra, and then there is the direct instruction or Transmission Mahamudra. So there is a lot that one can talk in the views, but in the Kagyu School the Mahamudra view is the accepted view. So making the relic one needs the right motivation which is the Bodhicitta motivation, right view, which is the Mahamudra view, and the third one is having the Empowerment and maintaining the commitments of the Empowerments. If the Guru who is leading the pujas have those three things, that is the perfect Guru. It’s not always easy to find the Guru who can meet all the three criteria but whoever meets as many criteria as possible is also acceptable. People can’t tell who has these criteria and who don’t, because one can’t tell it by looking at people who meets all these qualities. So this time when we work on the chorten, if everybody can think of all these things and of the importance of motivation, then this is going to be very, very beneficial for all sentient beings. So, I have given a brief introduction on that. There are some other pujas which are needed for the ground preparation, but they have been done for the Samye Ling chorten with Lama Paya before, so we don’t need to do the ground preparation. The benefits of a stupa are immeasurable. They are usually classified in four areas. There is the liberation from just hearing about chortens, there is liberation from touching chortens, there is liberation from tasting chortens and liberation from seeing chortens. So people get liberated from all these four things. The tasting one is where for example something has been offered to the stupa and then if people take that as a blessing and eat it, that would be how they would get the benefit and liberation from tasting of the chortens. The others maybe circumambulating the chorten or… seeing a chorten and hearing about chorten, these are straightforward. And the relic is really quite important for chortens, because people who build the chorten they will know what kind of relics have been used, and if the relics are not very good, then those people will not feel great devotion to the chorten and they will have maybe the wrong view and they will think: “Oh well, the relic wasn’t very good.” So they are not going to feel that much devotion to the chorten. That’s why it’s quite important to get the relics right and so that everybody gets the full blessing of the chorten. Therefore if one gets the relics completely right, then people are going to get the blessing even better, and even just doing one circumambulation has great blessings. Some people may say: “But how does circumambulating a chorten… how do you get a blessing from it?” Really the blessing depends on the person circumambulating and the devotion, the trust that person has in that chorten. So it’s important that the chorten looks right. It needs all the standards for a good chorten and that it has a very good relic in it. And then if everything is right, then all these interdependent factors coming right together, that the person circumambulating feels devotion and then the blessing is coming through that. If the devotion is not there, even if the Buddha Shakyamuni himself appears in one’s front, nothing much happens, because the devotion is not there. Therefore Lama would like to stress again about the relics, so that everybody works with the right motivation for the relics and all our hard work is going to be great benefit to everybody, if one thinks about all the things that are necessary for making the relics. Building a chorten or making an image of Buddha like statue, one doesn’t make these for oneself, because you can’t live in a chorten or you can’t use a Buddha statue for anything, so these are done for the benefit of others. Just as Akong Rinpoche and Lama Yeshe Losal have expressed to Lama Phuntsok that they would very much like to have this chorten in Samye Ling, and Lama-la hopes that we all can work together and build this chorten as quickly and as perfectly as possible. And he hopes that the auspiciousness, when we all reach enlightenment, that we all reach enlightenment in the same Pure Land. So we are going to sow the seed for enlightenment together this time. Lama: The lay people can take the precepts till the sun rises tomorrow, that is the procedure. So, one keeps the precepts till the next day. The sanghas normally take those precepts for life and this is the skillful way of Buddha that he has devised this way for the lay people. For chorten the precepts – the person needs to have taken refuge first. Then once the person has the refuge then you can take the precepts in two ways. The first way is: if the person has one’s own Guru, then the person can take the precepts from one’s own Guru. And if the person doesn’t have a Guru, then the person can use a presentation of the Buddha and take the precepts from that image. In the Kagyu School the Dakpo Rinpoche has also said that people can take the precepts from a physical representation or if even that is not there then a visualization is fine. So one visualizes the Buddha in front and then takes the precepts from that. It’s also accepted. Lama: One needs to have taken the refuge first, yes. Lama: Tomorrow the puja is like asking for permission from the owner of the ground, asking their permission so that we can build the stupa on it, that’s the puja for that. And also purification for the ground. It’s quite important to take the permission from the local deities, because if we don’t do that, then sometimes they get upset and cause obstacles. Obstacles can be disease or all sort of things in the process of building a stupa. Question: When does the puja start? Question: Where is it held? Lama: Where the stupa is going to be. Lama: Just do it together. Lama: Yesterday when the tsoshin was cut, Lama has also done prayers for that. And when preparing the relics we prepare them together, the big one, and then use some from the big one for the small ones. Lama: For tomorrow Lama Phuntsok will come and help with the Sojong. It’s called Sojong, the taking of the precepts. And then after that the people who are going to work on the chorten, first thing, they will come to the temple and take the precepts themselves, then start the work. Lama: Lama will give the text tomorrow; yes, it’s similar to the one in Nyungne. People who are going to make tsa tsas, they have to do a special Sojong, in which they will just form a group and they will do that themselves, and then the people who are going to write the mantras on the tsoshin and do the mantrapapers, they will have a different Sojong, and they will do that. And they will come to the temple and do the Sojong there. And people who are going to work on the grounds, they don’t really need any special Sojongs. Translator: Tomorrow? Tomorrow, Lama-la said they will just do at the site, just before the puja. Lama: Just people who are going to do the puja, they will need to take the Sojong tomorrow, not everybody. It’s not for everybody to take the Sojong. And when we start working with the relics, then people who are involved directly in working with the relics, they need to take the Sojong. Lama: Lama is not quite sure how the groups are going to be, but temporarily it seems that for the mantras it might be Ani Kunzang and for the tsa tsas it could be Tsering Tashi. But there will be further discussion, and once that is decided, then everybody will be told. Lama: Yes, people are allowed, but they need to report to whoever is organizing the ground work, and then they just talk to that person and do the work. Akong Rinpoche will probably organize the groups, who are going to do different jobs, and then we will know more clearer who is doing what. Lama: I think Lama is not quite aware about the organizing of the work yet. Ani Tsultrim thinks Akong Rinpoche might have a list. Maybe it’s just quite not formed yet. I think it’s still quite early talking about it. Lama: Fasting is starting after lunch. You are allowed to have breakfast and lunch. Translator: Gyamtso thinks people who can do these different jobs best (skill), people who are good at doing tsa tsa will go to tsa tsa, people who are good at digging, can go and do the digging, people who are good at writing mantras would write, so, whatever people are good at, going to that group maybe a good idea. Lama: Strong people can go and do the building. sipe chole drowa drolwar sho. which is rocked by the waves of birth, ageing, sickness and death.